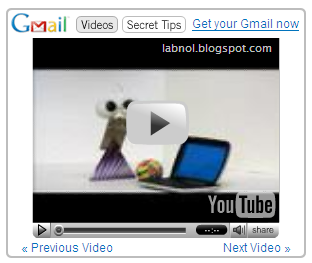 » The Adsense gadget has an embedded Youtube player that serves the four videos of GMail Theater Ads directly from Youtube. » The YouTube player is 250x200 pixels while the Adsense Ad size is 300x250 pixels. » The Adsense Flash widget is actually served by Lab Pixies, a company that also creates gadgets or widgets for personalized pages like PageFlakes, Google Personalized Homepage and Microsoft Live.com. » Though the images in the ad are served by LabPixies, they are redirected via gmodules.com/ - a Google owned site. "To find all emails from a certain someone, type from: and their first or last name into the Gmail search box. It is unclear whether these are CPM or CPC ads since they mix Flash video with text, something that we haven't seen before. Update: The performance of these Youtube Adsense Ads can be easily guess from the links feature of Youtube. Full story.